[unpad.ac.id, 4/7/2018] Universitas Padjadjaran is ready to support the success of Asia’s biggest sport event or 2018 Asian Games to be held in Indonesia, next August-September this year. One of the support forms is to initiate 2018 Asian Games Pre-Event which contains of two main activities such as Parade and Exhibition of Traditional Sport that integrated with Unpad’s annual event Traditional Sport Olympics [Olimpiade Olahraga Tradisional/Ootrad]. This event will be held in Unpad Dipati Ukur Campus and Car Free Day Area at Jl. Ir. H. Djuanda, Bandung, on Sunday morning (8/7). 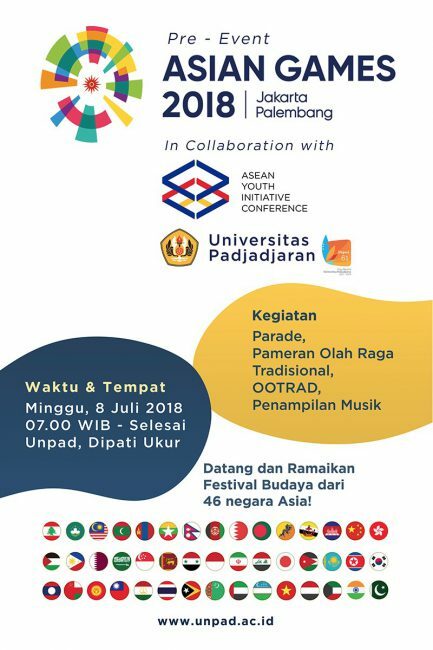 This parade and exhibition showcases the cultures and traditional sports of the 46 participating countries in the Asian Games 2018 by academicians, foreign students, and educational staffs in Unpad and community representatives. This event will be opened by the Minister of Youth and Sports of the Republic of Indonesia, Imam Nachrawi in the south parking lot of Unpad Dipati Ukur Campus. In the opening, He will also promote the 2018 Asian Games to participants and the people of Bandung. The Parade will be started from the opening site at the south parking lot of campus to Car Free Day Dago area and will be finished at Cikapayang Park which will be the center of the event. All the excitement and the highlight of the event will be held here. Furthermore, the parade will return to Unpad campus via Hasanudin road. After the Parade and Exhibition, Ootrad will be held as part of the celebration of the 61st Unpad Dies Natalis. Taking the theme of “The Power of Asian Tradition from the Land of Legend”, Ootrad will showcase various types of traditional sports from West Java. In this year, there are 5 branches competed, namely stilts and four-series race that includes: carrying traditional rice container called boboko, sack and clog racing, and carying torch racing. In addition to holding the 2018 Asian Games pre-event event, Unpad’s support is also seen from the use of Jati Padjadjaran Stadium at Jatinangor campus as a training ground for the Asian Games participants. This stadium complements the use of Gelora Bandung Lautan Api and Jalak Harupat Stadium in Kota and Kabupaten Bandung as one of the locations of the Asian Games 2018.